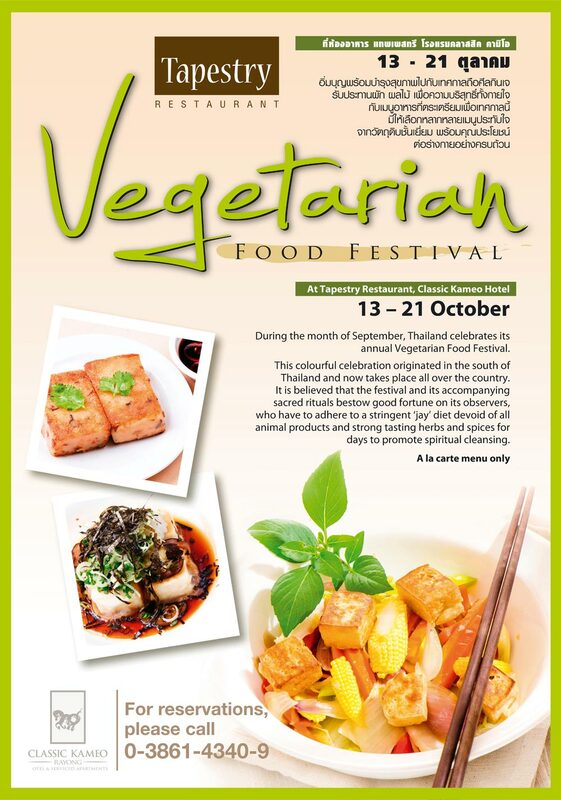 Each year, Thailand celebrates its Vegetarian Food Festival. It is believed that the festival and its accompanying sacred rituals bestow good fortune on its observers, who have to adhere to a stringent ‘Jay’ diet devoid of all animal products and strong tasting herbs and spices for several days to promote spiritual cleansing. From 13 – 21 October, a variety of vegetarian dishes specially prepared for this occasion will be served a la carte menu only at Tapestry Restaurant on the ground floor of Classic Kameo Hotel, Rayong. วันที่ 7 กันยายน 2558 เวลา 10:29 น.